Blog 2018 - Who’s Using What Content – and Why? We wanted to learn how the use of varied content types drives impact in research, teaching and learning. Peer-reviewed journals are still essential for research and teaching, but the mix of content used by faculty and students has expanded to include primary sources, ebooks, video and much more. 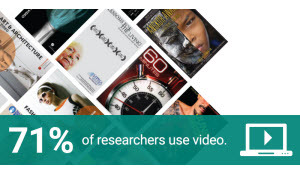 But why are researchers and students choosing the content they do, and how can libraries keep up? 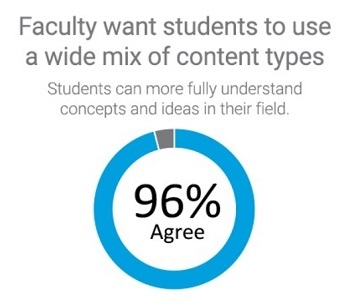 Faculty say that a mix of content aids students’ understanding of a subject, contributes to better quality assignments and grades, and allows for a more thorough review of existing literature and research findings. Faculty encourage students to use primary sources – they believe these sources help students develop critical thinking and other key skills. 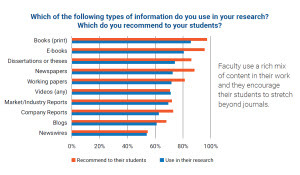 Students are influenced by their professors’ recommendations when choosing content to use in their research and assignments. Faculty see a crucial role for libraries in developing undergraduates’ research, critical analysis and information literacy skills. There were a few surprises, too. Get a first look at the results of our latest study, “Understanding the Content Researchers Use and Value.” See the infographic and request the whitepaper, which includes a full description of the survey. UPDATE: A recording of this webinar is now available. Watch it here. The authors of the study will discuss the results of the survey and what it tells us about the changing landscape of research, teaching and learning in an ACRL webinar on August 7 at 1 p.m.: How the Use of Varied Content Types Drives Impact in Research, Teaching and Learning. Register for the ACRL webinar now.